The narrative of modern art was established by critic Clement Greenberg upon the foundation of what was deemed to be the most essential element of modernist painting: flatness. Within this framework painting is distilled to its very core with the sole, unique factor of painting, the flatness of the surface and its two-dimensional form, posited as central to the medium. Flatness rejects painterliness, representation and depth; however, even the thinnest application of paint contains some quality of dimension. Almost sixty years since Greenberg published his treatise on flatness, Modernist Painting, what significance does this concept hold in the postmodern, or post-postmodern era? After the dematerialisation of the art object, super-flat, the rise of video art, even the contemporary resurgence of flat-earth conspiracies? In the hands of painter Jarek Wojcik, this flatness can be posited as a means of enacting tension, an intervention into traditional perspectival space. This point of tension where perspective and tradition are challenged by the presence of the contemporary allow for broader frameworks of understanding fill the picture plane. Wojcik’s technical grasp of representational and perspectival painting deliberately speaks to Old Master traditions, not only through the objects and themes that Wojcik explores, but also in relation to his use of light and shadow. A fascination with spatial operations, interiors and architecture play out across the surface of Wojcik’s earlier works, with these spaces later becoming infiltrated with boars, lizards and fruit -- evoking a sense of the uncanny within the still life tradition. 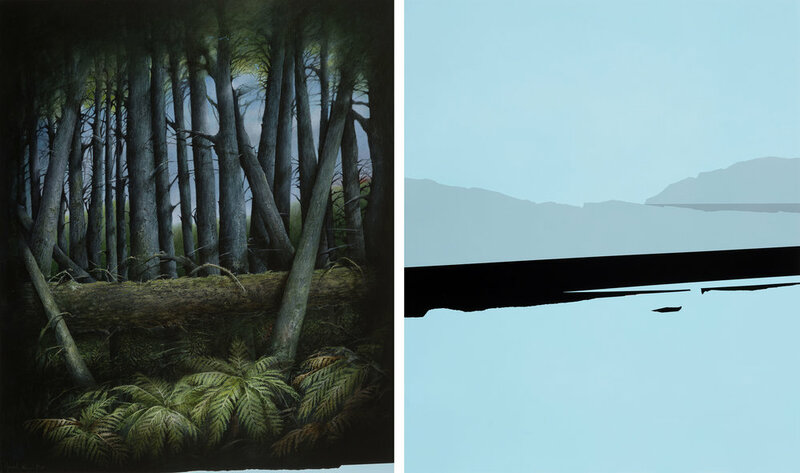 In Wojcik's latest body of work, Other Side, these uncanny spaces become filled with an abundance of lush tropical growth, rich forested landscapes, intensely punctuated by both movement and a sensitivity to place and local imagery. The contemporary is a period of contradiction, according to artist and theorist Liam Gillick, and it is within this sphere of pluralism that Wojcik operates. Flatness meets realist depths, and the artist is seen to intervene into the perspectival space of the realist interior. Flat cutaways of bold colour fracture perceptions of the landscape, which, in visual terms, act as disruptions to the reading of the work. Contradiction and pluralism are subsequently invoked at the site where the surface/depth binary is interrogated and rejected. In addition to flatness invoked by the interventions of bold colour, Other Side sees Wojcik explore the potentiality of new and industrial material, with bold blue metals framing his paintings, like a vessel for the works within. The collision of these two distinct histories of painting upon within Wocjik’s works are markers of the contradictory as key to our understandings of contemporaneity, a period of time within art and the world more broadly that locates meaning in these sites of betweenness and liminality. The representational qualities of Wojcik's painterly practice not only speak to masterly traditions, but are weighted with an intense significance for the contemporary painter. For theorist Boris Groys, realism and the real are positioned as products of a contemporary resurgence, linked to the idea of mimesis. In Wojcik’s work, the extent to which his canvases evoke the feather of the cassowary, or the texture of bark lead to meditations on realism and mimesis as concepts inextricable from his practice. However, Groys is right to question the reality that is represented on the surface of a painted canvas, when he asks, ‘How do we initially meet reality? How do we discover reality in order to become able to make an image of it?’ Painterly images of realism are celebrated, not for their subjectivity or engagement with technologically enhanced views of the world, but for their representation of the average, the real, and that which is ‘ordinary, profane’ and of the world. Wojcik’s engagement with realist painting, can also be positioned not only in line with the tradition of historical realist painting across centuries, but as having new significance in the contemporary era - and era where the limits of the real are expanded and where the artist, through the hyperconnected digital sphere, is linked to their work through the digital documentation and proliferation of images, biographies, and CVs. The artwork then becomes real in contemporary terms, real because, despite acting as a signifier of work in the non-digital world, documentation of the work is integrated in the digital sphere alongside the accessible virtual documentation of the artist who is thusly rendered as ordinary, as profane.Rendered as real because ‘there are no walls in internet space’. The contemporary significance of realist painting is linked to this proliferation of documentation and information in the digital sphere, transforming notions of the real, and redefining the inherent symbolism of realist painting. The hyperconnected, globalised, digital nature of the contemporary era may influence the signification of realism, however, specifically, for Wojcik, this notion of the globalised era and painting in a time ‘without walls’ or demarcations reverberates on the pictorial plane. Groys asks ‘how do we discover reality in order to become able to make an image of it?’. For Wojcik, reality is discovered and rendered with a particular sensitivity and experience of place. The narrative of art history, a narrative which includes Greenbergian notions of flatness, is presented in hierarchical terms, with Western-European history dominating the historical record, and delineating the origins and limits of art movements across the globe. Linked to Enlightenment thinking, the West still inhabits a stronghold at the centre of reason, origin and thought, with the East posited as a site of shared myths, time-lags and silence. The centre/periphery divide has come to dominate the narrative of art history, with the accepted view of movements originating in the traditional centres, such as Paris, London and New York, and filtering through to the periphery - traditionally the East and the South. Interrogating the validity of centre/periphery claims is central to emergent research spheres in art, and in theory developing within spheres of gender and identity politics. The spatial metaphor of the centre/periphery speaks to a particularly institutional, patriarchal and colonial retelling of history. However, for black feminist theorist bell hooks the centre/periphery dialectic can be seen a site of power for marginalised voices, as a demarcation of a radical space. For art historian Piotr Piotrowski, the perceived dominance and hegemony of the centre is what empowers the marginal and peripheral - who are located in a space where the centre can be critiqued, utilised and cracked, through the critical pressure upon tensions within a homogenous reading of dominant art histories. It is these cracks in the homogenous reading of place that Wojcik renders in visual terms, through his flat, bold interventions in the surface of the work, and through his perspectives and personal experiences of place. The Europe that inhabits the centre is the Europe of the English, the Dutch, the French, and less so the Europe of Lithuania, Slovenia, Russia, or Poland - countries located within the periphery, countries with their own colonial histories, relegated to peripheral status on the stage of global art history. Countries between the Orient and the Occident. As Piotrowski identifies, ‘In one word: there was not one Europe: it was both the colonizer, and colonized, imperial and occupied, dominating and subordinated.’ Inhabitants of European countries on the periphery are not Others in true and fixed sociological terms, but due to their peripheral and often marginal experiences, are ‘not-real-others’ in the language of Groys, which has come to infiltrate attempts to apprehend this divide. Wojcik paints as a ‘not-real-other’, as an artist who knows very well where he is, located not only as a Polish painter between the Orient and Occident, but also as a Polish painter in Australia, a country not only with it’s own colonial legacies, but a country engaged in the language and experience of the North/South divide. As not-real-Other, Wojcik finds himself located on the edge of the West to East periphery, as well as the North to South periphery, the latter being one which has come to dominate contemporary exhibitions and biennials on the global stage (particularly Adam Szymczyk’s documenta14). This exhibition sees the artist consider place in light of the influence of this universalism, exploring his vision and experience from an acknowledgement of the power within the periphery, and a sensitivity to his location as a not-quite-other, between places. In the same manner that Wojcik renders the museum in his earlier works, he apprehends the magpie, the cassowary, a forest that appears indisputably Victorian. Amongst these paintings is an interloper, a rooster - an animal seemingly disconnected from the language of place Wojcik is exploring. However, the rooster becomes significant when sited as a marker of the coloniser, a sign that sits within the exhibition as a marker of conscious consideration. So, when Groys questions how reality is discovered, for Wojcik, this reality is discovered and rendered with a significance and sensitivity toward hierarchies of art and history, as indelibly connected to experiences of place. Clement Greenberg, ‘Modernist Painting’, Arts Yearbook, 1, New York, 1961. Liam Gillick, ‘Contemporary art does not account for that which is taking place’, e-flux journal, #21, December 2010. Boris Groys, ‘Toward a New Realism’, e-flux journal, #77, November 2016. Boris Groys, ‘Art In the Age of Biopolitics: From Artwork to Art Documentation’, Catalogue to Documenta 11, Ostfildern-Ruit: Hatje Cantz, 2002: 108-114. Groys, ‘Toward a New Realism’. bell hooks, Feminist Theory: From Margin to Center, Cambridge, MA: South End Press, 2000. Peter Piotrowski, ‘Towards horizontal art history’, in Anderson, J. ed. Crossing Cultures, Comité International d’Histoire de l’Art, CIHA, Carlton, 2009: 82-85. Piotr Piotrowski, ‘East European Art Peripheries Facing Post-Colonial Theory’, nonsite, issue #12, August 2014. Boris Groys, ‘Europe and Its Others,’ Art Power, The MIT Press, Cambridge 2008: 173–182. Piotrowski, ‘Towards horizontal art history’, 83. Let no one say the past is dead. The past is all about us and within. Recently, I was reading The Past, a poem by the late Oodgeroo Noonuccal. It is in an old book of black poetry edited by Kevin Gilbert1 which I have absorbed over and over. The pages are now thin and stained from my cups of tea and the book smells old but familiar, like my father’s study. I have sat quietly with Oodgeroo’s thoughts, feeling the rhythm of her pen. She wrote so vividly about being caught in the two worlds of suburbia and her Ancestral connections and memories. She was passionate about her people and longed for a time before ships and houses, when Minjerribah was just theirs and the campfires never went out. Oodgeroo wrote about father sky and mother earth and the space in between. I reflect on this when thinking about where our Ancestral memories sit. When suburbia begins to take over, it is this space in between father sky and mother earth that carries both our physical presence and our culture. It is in the land, it is carried on our waters, it is sung by the birds and now it is in the structures and concrete layers of the cities we live in. Oodgeroo wrote that “the past is all about us and within”. This is true of Kent Morris and his Barkindji connections and it is true of his imagery, layered with symbolism evoking the spirits and cultural practices of his Ancestors while critiquing the imposition of buildings on Aboriginal land. His works create a First Peoples’ visibility within the harsh landscape of the built environment and are carefully considered studies of his Barkindji country and the country of others where he lives, works and travels. When I look at Kent’s work I see shields that our Ancestors made, I see designs that we painted on our bodies and the ground and I see the familiarity of buildings that I sit within every day. Importantly, I see a statement of culture that rejects the monuments of colonisation, symbolic of the displacement of First Peoples. He reshapes these spaces to reclaim them. The works have strength because of their exceptional attention to detail and technique but are always underpinned by country. In his series Unvanished (2017), Kent reminds people that there is a continuum of culture that does not stop when the land changes. It is present and ongoing, and through his view we are privileged to see the world through Barkindji eyes. The geometric markers of identity from south-eastern Australia form a hypnotic movement in the mirrored photographs of his works. These designs refer to our customary practices and are a clear statement of Sovereign presence. The strength we feel when in the presence of his works is informed by genetic memories passed down from thousands of years of connection to country and thousands of years of knowing what the crow or the cockatoo is telling us. Kent’s use of birds is significant. They are symbols of culture and they form an integral part of who we are as First Peoples. They have many meanings and come to us as messengers, as creators and as our protectors. Kent’s works speak strongly to me like words from Oodgeroo. They affirm that culture is within and around us, that we are resilient, and that we reclaim this space whether we sit within houses of brick and mortar or by the rivers where our old people camped. Kent sees beyond the built environment, using it and reshaping it to highlight our culture and our history which are often visually absent in the landscape. Strong in life and culture, Unvanished boldly states we are still here. 1 Noonuccal, Oodgeroo. ‘The Past’, in Inside Black Australia, an anthology of Aboriginal poetry, edited by Kevin Gilbert, Penguin, Melbourne, 1988. 2 Hardy, Bobbie, Lament for the Barkindji: the vanished tribes of the Darling River Region, Rigby, Adelaide, 1976.